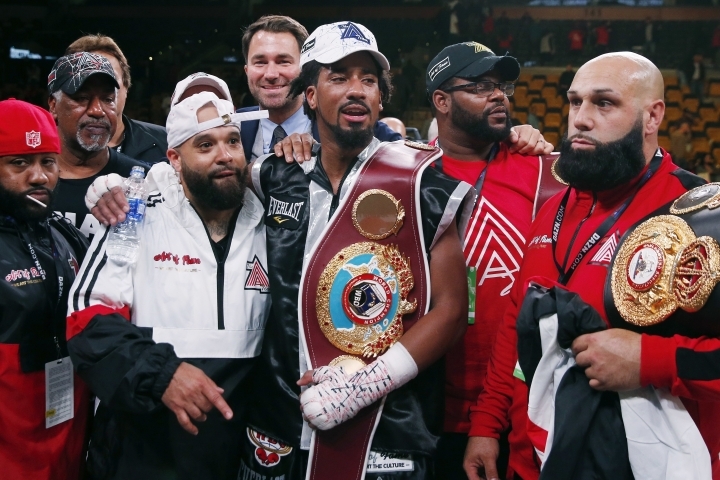 BOSTON — Demetrius Andrade won the vacant World Boxing Organization middleweight title with a 12-round unanimous decision over Walter Kautondokwa of Namibia on Saturday night. Andrade (26-0, 16 knockouts) dropped Kautondokwa four times in the first four rounds, once in the first and third, and twice in the fourth. Glen Feldman and Marcus McDonnell scored the fight 120-104. Ramon Cerdan scored it 119-105. In the first round, Andrade dropped Kautondokwa with straight left hand while Kautondokwa was off balance. Andrade sent Kautondokwa to the canvas again in the third with an overhand left that landed on the top of his opponent's head. The knockdown followed Kautondokwa's first significant offense of the fight, three punches to the body. 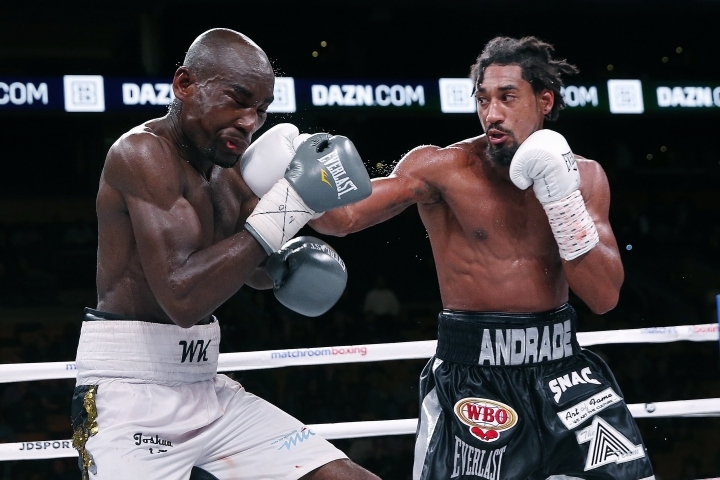 In the fourth, Andrade scored two more knockdowns, both with left hands to the head. He kept his distance for the rest of the fight, landing quick combinations to end most rounds and avoiding most of Kautondokwa's return shots. "After the fourth round, he went into cruise control," said Eddie Hearn of Matchroom Boxing, Andrade's promoter. Andrade said he entered the fight with an injured left shoulder. "It's a little injury," he said. "It bothered me for about a week." Andrade, of Providence, Rhode Island, previously held in the WBO and World Boxing Association junior middleweight titles. He was also a member of the 2008 US Olympic Team. Kautondokwa, the WBO African middleweight champion, dropped to 17-1 with 16 knockouts. Kautondokwa, 32, was a replacement for Billy Joe Saunders. Saunders tested positive for oxilofrine, a stimulant, in a drug test administered by the Voluntary Anti-Doping Agency. The WBO stripped Saunders of his title after the Massachusetts State Athletic Commission declined to give him a license in a hearing on Oct. 9. "It was definitely an adjustment," Andrade said. "(Kautondokwa) was bigger, taller, longer. Saunders is a slick southpaw. That's where my amateur background helps. You step on a scale, you fight whoever they tell you to fight." Hearn said Andrade is likely to fight again in January or February. Eventually, Hearn and Anadrade would like a fight with WBA champion Canelo Alvarez, who recently signed an 11-fight, five-year contract with DAZN, the online streaming platform that broadcast Andrade's fight. "Canelo has an 11-fight deal," Hearn said. "One of them will be against Andrade." The fight was one of three world title bouts on the card. In the co-main event, 2012 Olympic gold medalist Katie Taylor, of Ireland, retained her International Boxing Federation and WBA female lightweight titles with a 10-round unanimous decision over Cindy Serrano, of New York. All three judges scored the bout 100-90 for Taylor. "She was very defensive," said Taylor, who is now 11-0 with five knockouts. "I expected more from Cindy tonight." Serrano dropped to 27-5-2, with 10 knockouts. Tevin Farmer, of Philadelphia, defended his IBF super featherweight title, stopping James Tennyson of Belfast, Northern Ireland, in the fifth round. In an IBF featherweight title eliminator, Kid Gallahad of Sheffield, England, won a 12-round unanimous decision over Toka Khan Clary of Providence, Rhode Island. The official attendance was 6,874. 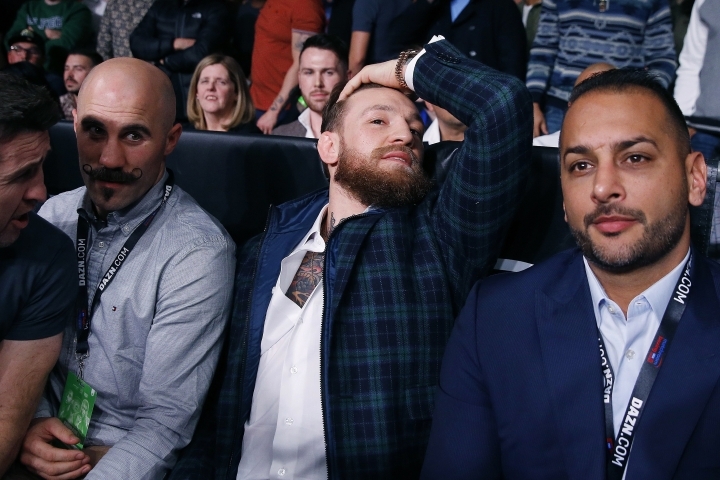 Former two-time UFC champion Conor McGregor was at ringside. "He came into my dressing room before my fight and wished me luck," Taylor said.